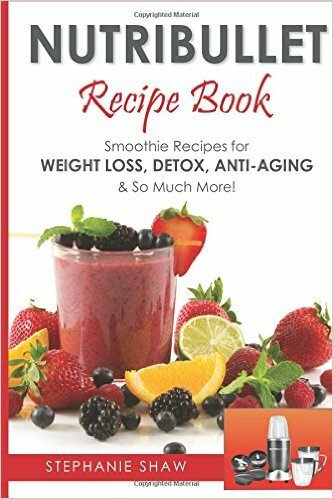 Synopsis: Nutribullet Recipe Book makes it so quick & easy to utilize all of the nutrients that natural foods have to offer in fresh, delicious & tasty smoothies. On the day you start using your Nutribullet you'll receive a huge boost to your body & wellbeing. The boost of vitamins, nutrients, minerals & antioxidants will start restoring you to your natural balance by cleansing & detoxing with the result being that you feel happier & more energetic than you've felt in a long time! As well as feeling amazing & so full of energy, you'll very soon notice the weight dropping off & your skin looking incredibly radiant. Furthermore, you'll find you’re that blood pressure & cholesterol levels will drop to optimum healthy levels. Your organ health, metabolism & immune system will all get that boost that you so much desires goes without saying that you'll have a longer, happier & healthy life. All of these benefits (& so much more) in the time it takes to throw a few ingredients into a big cup & with a quick & simple press of a button! Nutribullet smoothies are powerful because they extract every last drop of goodness that your raw & natural produce have to offer. You'll be shocked when you realise how much nutritional value you throw away by taking off the skin, stem & seeds from fruit & veg.incidently, this is a great way to get your kids to have their fruit and vegetables with all of the vitamins, minerals & nutrients they need in a very quick & delicious way. They may even enjoy making the smoothies themselves! Take a step towards a longer, healthier & happier life. A life with more energy, more time & less weight. Your new radiance &that confidence await you. You won't regret buying the Nutribullet Recipe Book! About the author: I am a registered nurse, working with patients with long term conditions. I have now specialised in Diabetes. It is because I am dealing with conditions that do not respond well with medication like acute conditions and infections do, I have for the past 10 years, been looking at other healing modalities. I am interested in nutrition and various forms of exercise as they are the cornerstone of managing most conditions. I apply a mixture of modalities to treat pain, stress such as NLP, hypnotherapy, TFT, quantum touch. I have received training in angel healing and flower therapy which I find very useful tools in my healing repertoire. What I find rewarding is my clients being empowered and having happier and more fruitful lives. Review: This book is really good and l cannot wait to try some of the smoothie recipes and some of the recipes look really yummy and it’s good if you’re trying to lose weight or you just want to try something new or give your children something healthy and it is good to get your kids into something that’s good for them and they will like to help with making smoothies and it will help them drink it if they help l highly recommend this book to anybody even if they just want to try something new.